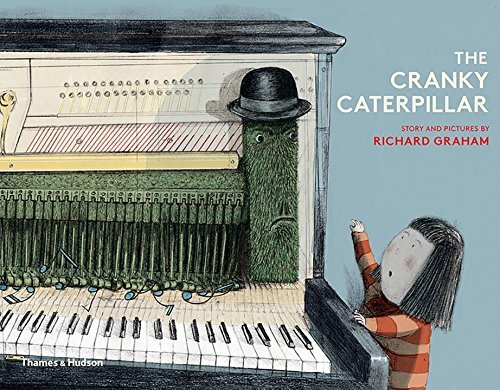 The Cranky Caterpillar by author/illustrator Richard Graham successfully toggles together sculpture, animation, fine art, and storytelling, forging a fresh take on the art of picture book creation. British artist Graham bases his Cranky Caterpillar character on a one-of-a-kind sculpture he created using recycled materials. He bases the young protagonist, Ezra, on an everyday, helpful, upbeat, and thoughtful little girl. The combination of the two is charming and original. Cranky Caterpillar lives inside an upright grand piano and has been there so long he has become part of the hammer assembly. Although he tries to make happy tunes, it is a useless and fruitless endeavor because he is now stuck there permanently, doomed to a gloomy existence. Sad music is all he can manage to generate. Ezra enters the family music room lured by the strange, somber sonatas, and is justifiably surprised to see Cranky Caterpillar inside the piano. She takes on his dilemma as her own, searching for all kinds of remedies to lift his spirits. Fresh air? Not helpful. Ice cream and treats? Not hungry. Funny hats? Too ridiculous. Seeking further assistance, a stumped Ezra recruits more friends. A band of Pablo Tuba, Gary Gee-tar, Wassily the Violin, and an unnamed cubist-style tambourine-tapping Cat play their happy hearts out. Colors burst into the scene, which was previously muted by low-key hues. The piano gets so worked up that it explodes and topples to the floor with caterpillar nowhere to be seen. Mystery hangs heavy in the once-hopping music room until the piano keys start a-fluttering and the air starts a-swinging as a transformed caterpillar brushes forward with his newfound butterfly wings. Not ordinary wings, but musical, colorful, artistic wings which bring out a big broad smile on caterpillar-now-butterfly’s face. Joyful dancing, singing, and gratitude energize the space. The illustrations are a nice twist on the current interest in up-cycling in art. Not only is Cranky Caterpillar an up-cycled sculpture, all of the musical instruments are up-cycled themes from art history. Pablo Tuba, with an ear to one side and a mouth to another, functions well as a take on Picasso. Wassily Violin represents Kandinsky who, as an early 20th century abstract painter, wrote theories about musical connections to color. Indeed, it is this very color-music relationship that serves to liven up caterpillar’s demeanor. With captivating characters, smart text and free-flowing illustrations The Cranky Caterpillar will resonate beautifully with readers.